JC de Vera on his dating status: \"Nagdi-date pero hindi pa girlfriend level.\"
JC de Vera on his dating status: "Nagdi-date pero hindi pa girlfriend level." “Tinatantiya ko kung kaya ba o hindi. Kasi first time ko mag-date ng non-showbiz talaga," says JC de Vera when asked about the non-showbiz girl he's currently dating. While he’s admittedly dating a non-showbiz girl, Kapamilya actor JC de Vera maintained that they are not officially in a relationship yet. “Hindi ko naman itinatanggi na nagdi-date ako ng non-showbiz [girl], pero hindi pa naman girlfriend level,” said JC when asked about his relationship status. PEP.ph (Philippine Entertainment Portal) was able to interview JC at the press launch of Imono Stainless Jewelry, held at Unit 27 Apartment Bar and Café, last October 27. JC was careful not to disclose details about the girl’s identity, except to say she’s “younger” than him and has “no connection” in showbiz at all. At the same time, JC said that he’s not in a rush to enter a commitment, especially now that he’s busy with the upcoming drama series You're My Home and the weekly gag show Banana Split. 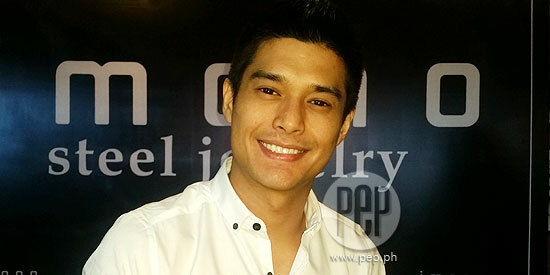 The 29-year-old actor explained, “Tinatantiya ko kung kaya ba o hindi. “Kasi first time ko mag-date ng non-showbiz talaga. [Someone na] totally walang alam sa work ko. Based on JC’s dating history, he previously admitted to having had romantic relationships with more or less 10 female celebrities. But the actor stressed that this doesn’t mean he’s a love-them-and-leave-them kind of guy. “Hindi [ako serial dater]. Ano lang yun, [part ng] kabataan. “Never naman ako nagsabay [ng girlfriend]. As in, one by one lang talaga,” he beamed. If there’s one thing he learned about handling relationships, it’s the importance of a couple’s willingness to make things work despite their differences. “Kailangan mo maging flexible kasi may person beside you na talagang walang alam sa industry. Since the girl he’s currently dating is not from showbiz, JC said that he tries his best to win her trust. “Natutunan ko kailangan mong mag-build ng circle of trust. “Kasi pag artista na, alam nila yung do’s and don’t’s. Eto fresh, wala talagang alam, e.
“So, you have to explain every single detail na ginagawa. "Kahit yung pinag-uusapan natin, i-explain mo pa bakit ganun answer mo, why you need to go to a presscon." Is the girl demanding when it comes to his time? JC answered, “No. Mas matured siya mag-isip sa akin. Mas understanding. "Yun nga kasi, kapag nasimulan niyo na trustworthy kayong dalawa, yung pag-intindi sa maraming bagay, mas madali."